There are many exciting careers available with a healthcare management degree. Read on to learn about five career paths for students with a health care management degree. Hospice administrators have oversight responsibilities with hospice care services, which include memory, post-acute and home health care programs. Hospice administrators are responsible for the overall management of their organizations. They accomplish this through supervising personnel, enforcing policies and updating procedures. They also have budgeting and scheduling responsibilities, so they must ensure the effective and efficient use of all resources. Hospice administrators ensure that clients receive consistent and appropriate quality care. They must have excellent interpersonal and customer service skills. Case managers provide case management services to potential and existing members according to established policies and procedures. They are responsible to oversee the delivery and coordination of quality health care and services for members. They must ensure that members receive timely and cost effective services. Case managers regularly review admission, continued stay and discharge plans and records. They communicate with members and health care providers to obtain important clinical information that is used to meet established eligibility criteria. Case managers must have excellent multitasking and project management skills. 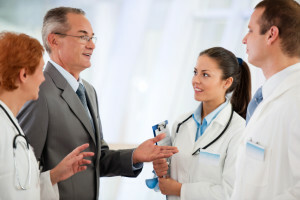 One of the unique careers available with a healthcare management degree is a quality auditor. These health care professionals seek to improve health care processes and reduce mistakes through medical auditing, according to the AAPC. They continually analyze reports and trends, identify significant opportunities for improvement and collaboratively problem solve issues. They often communicate with IT, health informatics and administrative professionals to accomplish their goals. They also work with vendors and external providers to ensure that they follow established policies and guidelines. Quality auditors also perform activities to maintain compliance with all regulatory agency requirements. They conduct regular internal audits and review random medical records, performance reviews and system documentation. Contract managers develop customer specific strategies to reduce expenses, maximize values and improve operational efficiencies. They manage multiple client accounts through monitoring customer service quality and feedback. They also organize and direct campaigns designed to raise awareness of the organization’s value for prospective clients. They perform market research, analyze operations and evaluate vendor and supplier propositions. They negotiate beneficial terms for their organization through leveraging advantages and using customized contracts. They also assess current contracts through in-depth data analysis to find savings opportunities and new contract opportunities. Revenue cycle managers are responsible for daily accounts receivable functions and operations. This includes identifying revenue opportunities through corrective billing reviews and maintaining current internal controls and policies. They must also audit delinquent accounts with financial managers and billing staff. Revenue cycle managers must have a strong accounting background with expertise in medical coding and billing. They must also have advanced technical skills and knowledge of Office, financial applications and health information systems. Additional careers available with a healthcare management degree include operations supervisor, compliance administrator and health care policy analyst.